The sound of a kookaburra laughing and the song of the magpies heralded the dawn of a new day as we stood in silent contemplation and remembered those who paid the ulitimate price. Last Sunday my daughters and I had the opportunity to visit the gardens of Gardening Australia presenter, Sophie Thompson. Built around 1847, Hamlyn Cottage sits on one and a half hectares (three acres) of land which include gardens full of Australian natives, salvias and succulents, (and too many more to name), an orchard with one hundred different fruit trees and a large vegetable garden, it is an inspiration to anyone who lives in a Mediterranean climate. Ducks, geese and chickens wander freely through the orchard and surrounding area eating weeds and keeping the bug population under control. At every turn there is something quirky and interesting to see, many of which were created by Sophie's husband Richard, from what other people would have considered junk. My girls, Samantha and Rebecca, checking out the vegetable garden. The latest addition to the garden, a pizza oven built to resemble the stump of a Morton Bay Fig, with gabion walls that represent the roots. Sophie's Patch is open annually over the Easter long weekend and is well worth a visit. I'm already looking forward to visiting again next year. 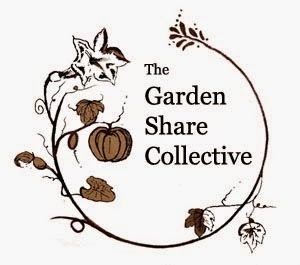 Welcome to another Garden Share Collective hosted by Lizzie from Strayed from the Table, a place for gardeners to share what has been happening in their patches over the last month. The month of February was so disappointing garden wise, I couldn't even be bothered writing about it and March wasn't much better. Most of the beds have been cleared of summer crops now with the exception of the zucchini, basil and pumpkins. The zucchini is still flowering and I am hoping to get a few more before the weather gets too cold, I have only harvested one so far. The basil is flowering and needs to be picked and the bed emptied, so I can sow the bean seeds. There are still 2 pumpkin vines, flowering and setting fruit, and I'm not sure what to do with them as I need the bed for peas, but I don't want to miss out on the chance of pumpkins either. Should I pull them out or wait a bit longer? Harvests for this month were a bit on the thin side with only one zucchini. Two of the smallest watermelons I have ever seen. The basil has been fantastic this year and I have had so much that I have been giving a lot of it away. Seedlings of Green Dragon broccoli (11), mini cauliflowers (6) and almost 2 dozen silverbeet seedlings. Well, that's it for this months Garden Share Collective. I hope you have all had a good month in the garden, I'm off to Lizzie's to see how everyone else's gardens have been doing.